Thank you for the effective treatment I have received through your care. Last summer, I spent several months, mostly in bed, with ice and drugs to alleviate my pain and mobility issues. Although my MD and subsequent Neurologist were able to prescribe medications that offered some relief, the core issues remained and continued to worsen. I sought alternative medical treatments with a gifted Acupuncturist and Chiropractor who both recommended I seek treatment with someone who was qualified in Atlas Orthogonal care. As my Acupuncturist stated, "You body whack!" Steady progress is what I am experiencing now. It is amazing to me how much, not just expertise and skill, but having that "gifted" status impacts the quality of treatment. 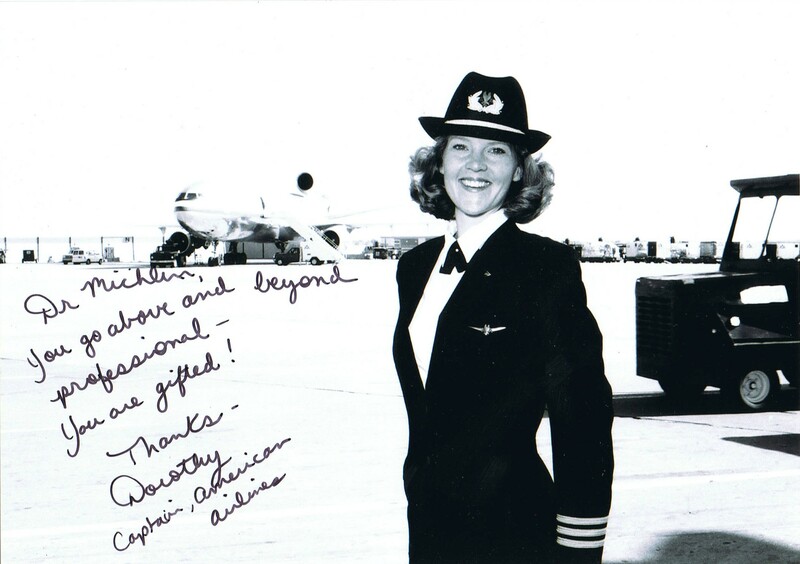 I am grateful that you have chosen a profession that manifests those gifts. I have been to several other Chiropractors (when travel was required) and find that while they were very good, your abilities and effectiveness are strikingly ahead of your peers. I am confident that I will achieve my peak level of attainable health as I continue treatment and remain under your care. I offer my highest recommendation to any others who seek true value and high impact for their health care dollars. I've been coming to Dr. Michlin for about a month, and I can tell you he has done more for me in this month than my other chiropractors had done in years! My hands would go numb when I tried to play the piano, do my hair, work in the garden, etc. I always had a stiff neck and would sometimes get pain in my lower back and down my leg. Everything is better! My right thumb is the last digit to have permanent numbness, and I cannot wait until that is fixed! I have about eight friends who come to see Dr. Michlin. They have been telling me for years how he could help me get back to health. They did not lie! I am so glad I came and tried it out! The best part is my sister, who has had migraines forever. She had a headache when she came in to the clinic, after her first treatment, her headache was gone!! AMAZING! She also felt a euphoric sensation up to her brain (like she was on some kind of medication). We figured out that it must have been the blood rushing back to her brain. Her atlas was out of place for years and pinched a nerve, which resulted in less oxygen to her brain and confused thinking. How great it is that her headaches are gone, she is thinking more clearly. I cannot wait for more great results! Around 1998 I started feeling pain in my right arm and fingers. At the end of the year the pain got worse and my right arm went numb. Lots of software engineers at that time had similar symptoms, generally diagnosed as Repetitive Strain Injuries (RSI). There was no good understanding how it worked, but it was related to the ergonomics of the working position. The remedy was rest and some pain medication for the short term and improved ergonomics and physical therapy for the longer term. Though this did improve my situation I kept having pain and fall backs to the old condition. Physical therapy was somewhat helpful, but it was clear to me it was not going to solve the problem. Through lots of gym exercises I kept the situation manageable, but certainly not free of pain and misery. When I met Dr. Michlin, he told me people had not been paying attention to the right signs, and that he was confident he could fix the problem. I was so ready to hear that my pain could be relieved. Up to that point, I felt all that had been done was managing the effects, but not removing the cause. I was with Dr. Michlin when he analyzed the X-rays. He found twists and bends in my spine, which probably had been there for a long time. He showed me how the atlas was out of alignment and how vertebrae were degrading and pushing on the nerves, which was causing my pain. As an engineer I found it relieving how scientifically based the Atlas Orthogonal method is. The analysis resulted in the exact adjustment Dr. Michlin made with the Atlas Orthogonal instrument. Though I did not even feel the adjustment, I certainly felt the results - my whole body started aligning and relaxing. Dr. Michlin often follows up with full spine and further specific cervical corrections. It always amazes me that when I point out where my pain is showing up, he switches it off like a light bulb. Dr. Michlin never promised it would be a quick and easy fix. In fact, I think I am one of his more complicated patients. We started with treatment three times a week, and I am now down to about once per week. It has been a journey, and we are still working on it. Dr Michlin peels away layer after layer of the problem. He gets right to the cause. I still have some setbacks, yet they come much less frequently and relief comes much quicker now. I know in the future, I will be completely free of pain again, which is a far better prospect then I had a year ago. 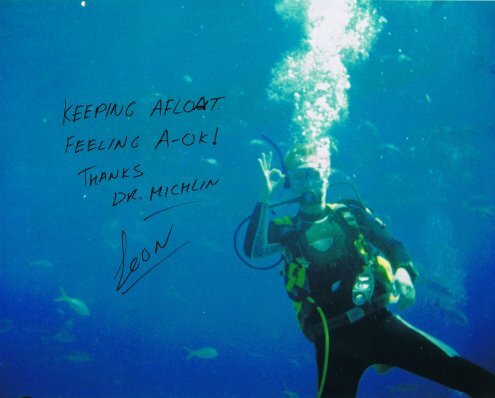 I highly recommend Dr. Michlin. For as long as Brooke can remember, she has had to deal with a host of issues. To name a few, she has suffered with digestive disorders, chronic fatigue, and vaginal pain for years. She has not been able to go to school or live a "normal" teenage life. Her Mom has taken her everywhere to find out what was causing her pain. 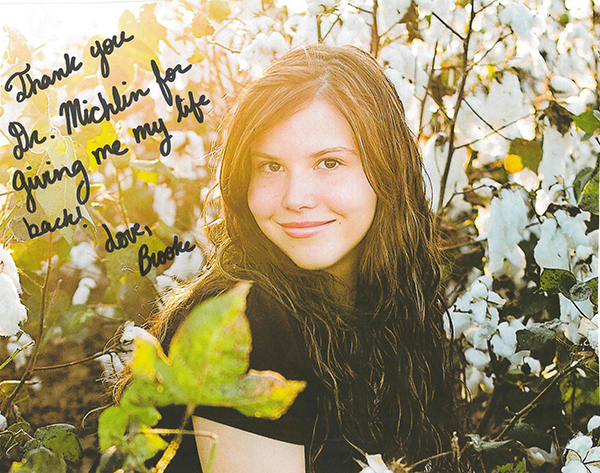 After a long road, Brooke was diagnosed with Dysautonomia, yet no one could help her get out of pain. At a children's hospital in Houston, a neurologist recommended she come to our clinic. Brooke and her mom drive three and a half hours to get to us. Through atlas and full spine adjustments, Brooke has finally gotten her life back. She was able to go back to school, go out with her friends, and date! Brooke graduated this year, and she is ready to start college in the fall!